The Chinese don't speak any foreign language, in general. And they don't want to help you much: they are afraid they fall short on their intentions. Service to customers is virtually unknown and you don't win anything with offering money because they lack the most elementary commercial feelings. And.... groups always come first, they distrust any individual initiatives. So someone travelling on his own or with his partner is put waiting behind a 30-odd group... Even if they arrive later than you did! Well, that was the situation in 1992 and that was the challenge I was going for ! Stepping stone was Hong Kong of course. While trying to get the jet lag out of our system, we enjoyed the ferry rides to the various islands. We decided to visit the Po Lin Monastery on Lantau Island. It has an enormous Buddha statue, which can be seen from large distances. But the people are the attraction, in my view. 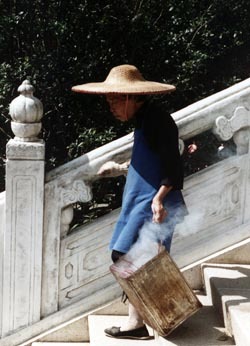 The old lady, going to and fro, cleaning the incense sticks from the altars (burned in large numbers, people are in a hurry and the numbers of incense sticks should compensate for their lack of contemplation it seems). And the old man, having his own thoughts about all this. Oh, and you don't want to go to the lavatories here... Animals ! Well, time to get our things together for China. We picked up our boat tickets with CITS and that's where we got our first flavor of China: the girls were sleeping at their desks ! Probably tired from a nightjob. 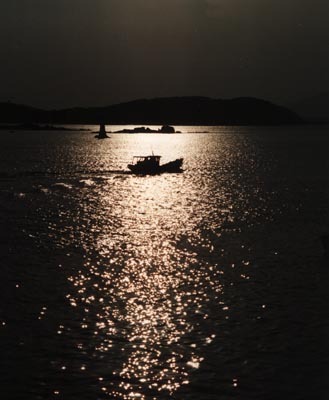 They could not tell me how long the sea trip from Hong Kong to Xiamen was, nor much else. Well, we'd see. 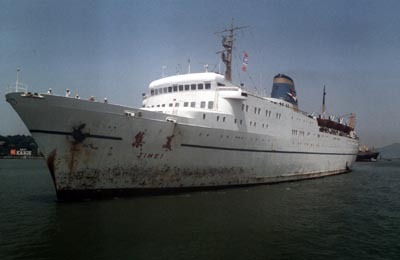 The ship had seen better days, but the facilities were not bad. The cabin was small, but clean. There was a thermos with hot water for us, but no tea or cups. And a pity the lights in the cabin did not work, as I like to read before I go to sleep. The walls are never thick enough not to hear the spitting of the Chinese, a sickening custom I'll never get used to. Dining is an adventure, as hordes of people go at their (inclusive) dinners like wildmen. Did I tell we travelled second class? Sailing time to Xiamen was 18 hours and it made a lasting impression. Xiamen is lovely little city, off the beaten track. It has a fishermen's culture and fish is what you'll find. 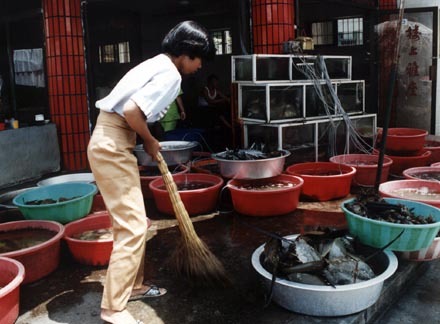 Due to lack of refrigeration, the fish are kept "fresh" by pooring water in the buckets and let it overflow from one in the other. We stayed in the Lujiang Hotel, which was nice and had a friendly staff (though very nervous if you tried to start a conversation, lots of giggles from the girls!). 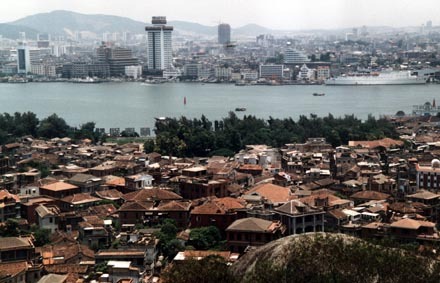 View from Sunlight Rock, which is on a small island off the coast: Gulangyu. It shows two different cultures. Foreign traders, like the British, Dutch, Danes, Japanese, Germans, French and the Americans, were allowed to settle here and put up trading houses and consulates. There is also a statue of Koxinga, who was a warlord in the service of a Ming princess, and who fought with his army from Xiamen the Dutch on present Taiwan. And won after a siege on Fort Zeelandia, in 1661 (lasting 6 months!). He was to go from there to the rest of mainland China, but this failed. A hero here, nevertheless. The harbor of Xiamen lacks the giant steamers, though the boat (ship?) we arrived on wasn't so small either; but there is a distinct flavor of "local". The sunset was peaceful. At no time did we feel unsafe after dark, at anyone place in China. 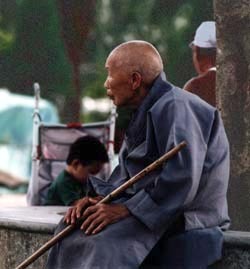 Travel on your own in China brings many uncertainties... If you don't travel in a group, you are frowned upon by the Chinese ! We had booked tickets for a flight from Xiamen to Shanghai; because virtually no one speaks English, just finding the check-in counter is a "blind man's game" ! It took some misunderstanding before we realized we had to pay a "construction fee" (airport tax) at a seperate counter. Then what ? A boardingcall is only done in Chinese. 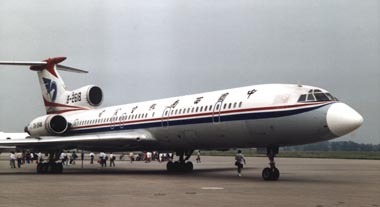 We did not see a plane of the company we had tickets with, China Eastern. We just started to walk with the crowd who had the same color boarding card as we had (no ticketing agent at the door to the ramp). We walked towards the plane on the photo but the crowd went past it (and under it) and then our plane came into view. Departure was swift and the flight was uneventful. We found the lack of safety instruction not very surprising, nor the fact that most Chinese passengers did not bother to buckle their safety belts and some in fact did not sit down during take off or landing ! Behavior in the streets is chaotic, nobody seems to follow the same set of rules! We found the famous boulevard, The Bund, broken up and in repairs for it was sinking in the river. So we found a different route to take in some atmosphere. Talking about atmosphere ! 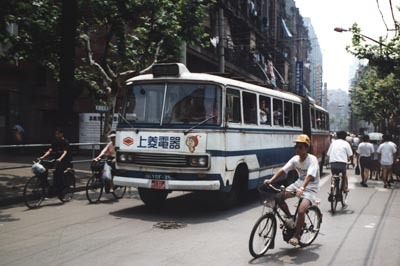 Since Shanghai is situated in a river delta and temperatures run up, the humidity (upto 85 percent and higher !) is very tiring. We found out, by a newspaper article, that the previous month counted 4.000 victims of sunstrokes and 3.000 were a normal monthly average! If you take into consideration the chaotic traffic with hundreds of cyclists, you can appreciate that we did not walk for hours ! There are so many things in the streets that surprise you ! Travel in China is confusing. The crowds are always impressive and intimidating. People will send you away and you don't understand why: you'll find out you need to go to a separate lounge, but nobody is able to tell you that. I'd had 10 lessons in basic Mandarin, so I could count, order tea and some other small things "on the road". But it did not stop me from being very confused. The trainticket is in Chinese characters and tells you nothing. You just go with the flow when you think it's time and follow people pointing directions to you. But I found the Chinese did that with a growl instead of a friendly gesture. And it can be sickening to sit there and have Chinese all around you spitting ! They do it everywhere: in the streets, in the trains (on the floors! ), on busses... When you hear their retching and scraping of their throats: beware, for they are indifferent where it will end up and it may be on you ! 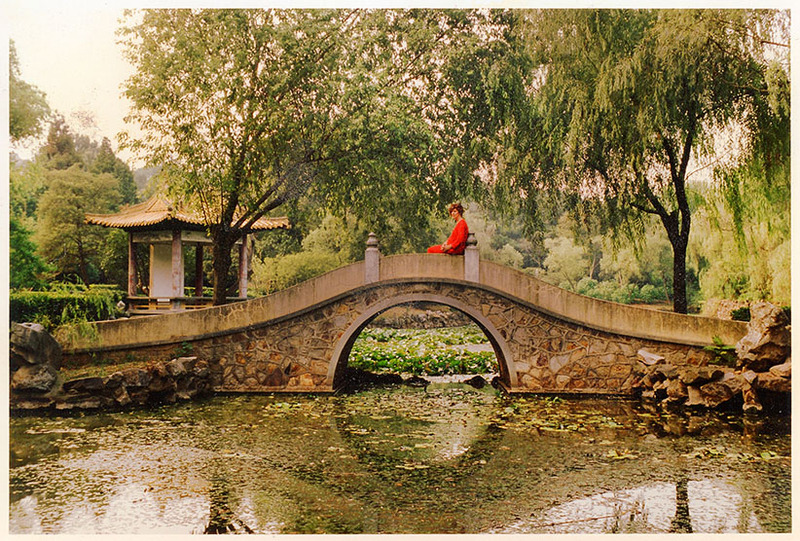 It depends of course on your definition of 'pretty', but the Chinese gardens are one of the few pretty things in China. 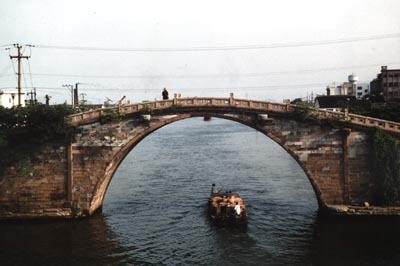 Things or events can be impressive (the Great Wall is impressive, not pretty, in my view), travel through China can make a lasting impression, but most things pretty were destroyed during the Cultural Revolution (1966-1970). 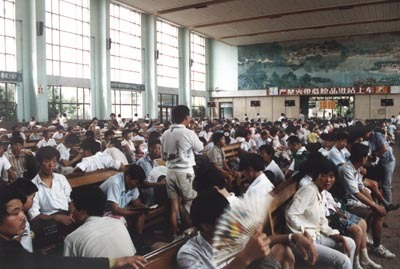 Pagodas were destroyed during this sad period, publication of scientific, artistic, literary and cultural periodical ceased'; movies and plays, from before the Cultural Revolution, were banned and library collections were destroyed. Though the further away you get from Beijing, the less drastic the effect was. Meanwhile some fascinating books have been published about this dark episode and the lasting effects on the Chinese since then. The Chinese gardens seem to have escaped this fate of destruction and these walled havens of tranquillity make for a nice visit. We had again braved the incertainties of travel in China. We knew we had to go to the railway station in Shanghai, to catch a train to Suzhou, but to which of the 3 railway stations? 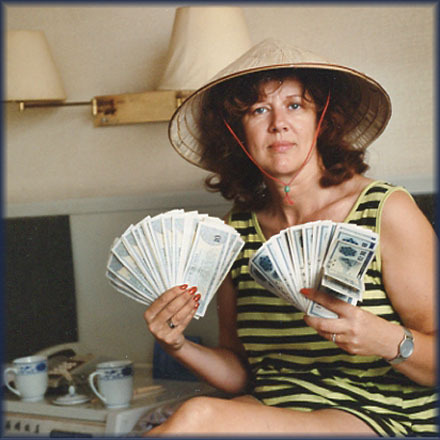 The frontdesk of the Chinese hotels we stayed in, were friendly and helpful, but prone to misunderstandings. We did find the right train. But where to get off if you can't read the names of the railway stations? Anyway, long story short, we got to Suzhou. And we found Suzhou the most beautiful city of our trip! 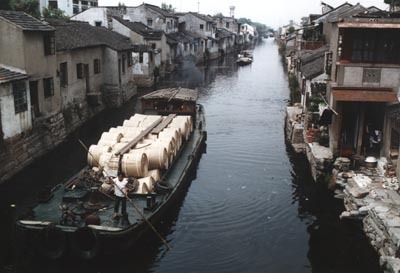 The history of Suzhou goes back some 2.500 years, it is one of the oldest towns in the Yangtse basin. If you consult a map, the layout of the old town is easy to recognize. You can see history all around you, it hasn't yet been replaced by faceless, 'progressive', concrete buildings. We rented bicycles for 3 days. The solid French plane trees make for a good cover against the heat of the day and cycling is a pleasure. When we took a break, we often faced the heat and stood on a bridge over one of the many canals, observing the boats with their varied cargo pass under us. A stroll is not out of the question either, there are so many things to see in the streets. We did not make a move without consulting Lonely Planet's Travel Survival Kit. The book is very helpful with "do's and don't's" and what to see, but also makes for excellent reading on subjects like history and customs. We had travelled from Suzhou to Wuxi and had enjoyed the perfect timetable again of the Chinese railway system. It is best to make reservations again for the next leg upon arrival, as it will take 3-4 days before a ticket will be issued to you. That is if you want a seat in the "soft seat section". Wuxi is called "little Shanghai" because of its enormous industrial growth, in which we weren't interested; so we settled on the shore of Tai Lake, a little out of town. On one of our walks we met this little boy; his parents enjoyed it when my wife played the part back on her video camera that showed their 'little emporer'. 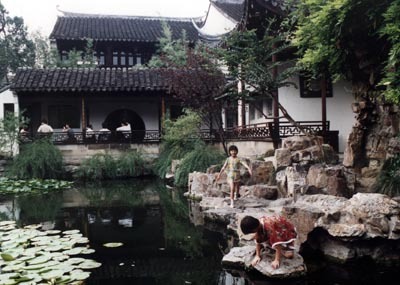 We enjoyed again the Chinese gardens and made long walks in the vicinity of our hotel. 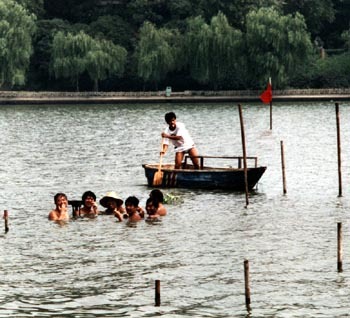 Tai Lake is very shallow, on average of about 2 meters deep. It has 30 species of fish and we enjoyed those that came to us through the kitchen of the hotel! In general we enjoyed the food, though some may find rice three times a day hard to stomach. The clay from the lake is used to form the rock formations in the Chinese gardens. With all the water around, the heat and humidity can make walking an effort, but there is plenty to enjoy if you take it slow and easy. Changed money, feeling rich with heaps of the local currency! We went to Nanjing (formerly Nanking) only to catch the flight back to Hong Kong. 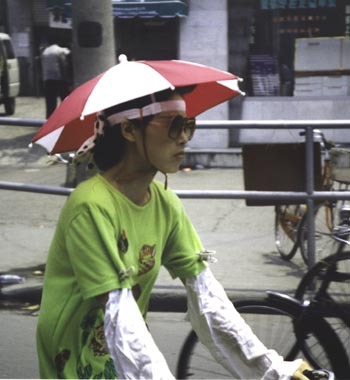 Nanjing is known as one of the three "furnace cities", the hottest cities in China. And while we visited, there was a heatwave ! So we only spent 1 night here and visited park at Xuanwu Lake; the videocamera fogged up due to the difference of temperature in our airconditioned room and the temperature outside; the camera was useless for over an hour. There was plenty to see, but I noticed some Chinese doing the sensible thing on a hot day like this: get into the water. What struck me was that they kept on smoking ! The men smoke during dinner, anything, but I hadn't seen this yet. I was invited into the water, but it was time to go back to the hotel and set our trip back to Hong Kong and onwards to home, in motion.